It's the dream of any child who has ever played hockey in Montreal. Rise through the ranks before making it to the Quebec Major Junior Hockey League. From there, maybe play in Europe before someday returning to the city. Former junior hockey star Patrice Bernier is living that dream, with an interesting twist. Sure, Bernier starred for the Val d'Or Foreurs and Sherbrooke Faucons of the QMJHL. And yes, he traveled through European leagues before becoming a hometown star in Montreal. The only thing is, Bernier quit hockey almost 15 years ago. 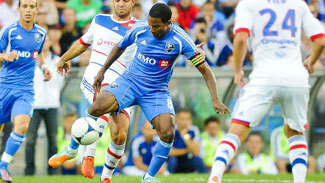 It's a decision that has paid off for the midfielder with Major League Soccer's Montreal Impact. "I played both sports until I was about 18. I went through all the rankings in soccer and hockey," Bernier, 33, told NHL.com. "I could have a tournament where I played hockey in the morning and then a soccer tournament in the afternoon. It was a bit draining -- 365 days of switching from soccer to hockey, sometimes in the same day." As a 17-year-old, Bernier starred on defense for a Val d'Or team featuring 10 future NHL draft picks. His first year in junior hockey, the 5-foot, 9-inch blueliner led all Foreurs defensemen in scoring. "Patrice was one of those guys you could tell was into soccer," said Jean-Luc Grand-Pierre, Bernier's defense partner in Val d'Or who logged 269 NHL games before playing for the Malmo Redhawks last season. "When you passed him the puck, sometimes, even if it was on his stick, he would try to handle it with his feet." Midway through Bernier's second season with Val d'Or, he was traded to Sherbrooke, leaving a team that would go on to win the QMJHL title. While his former teammates celebrated a trip to the 1998 Memorial Cup, Bernier was ending his hockey career to pursue soccer full-time. "Before I reached the QMJHL, I already knew that I wasn't going to be playing hockey as a career. Coming from Quebec, where hockey is everything, it's an avenue you can't deny," Bernier said. "I had spoken to some scouts and I was told I was good but small for a defenseman. I loved soccer since I was a kid, and my parents are Haitian, so the background there was soccer." After leaving hockey, Bernier played soccer at Syracuse University, where he was named to all-rookie and all-conference teams. From there, he played three seasons with his hometown Impact, who were then a lower-level club in the North American Soccer League. During a decade spent playing soccer in Europe, Bernier eventually reconnected with Grand-Pierre, by which time a unique opportunity was arising back home. "Last winter when I was playing in Sweden, he was playing in Copenhagen and it was only about a 30-minute drive to go over and see him. So I went over and watched him play," Grand-Pierre said. "I told him, 'Hey, Montreal is getting a [MLS] team, are you trying to get over there?' He said, 'We'll see what happens.' It ended up happening for him." "I didn't think I was going to come back. I never thought I would be coming home. It's priceless being home. It's been a great road." Following a decade playing in Norway, Germany and Denmark, Bernier signed with the Impact in December. Three months later, in a moment Bernier never could have imagined growing up in Quebec, the Impact welcomed almost 59,000 fans for their first home game. "I didn't think I was going to come back. I never thought I would be coming home," Bernier said. "It's priceless being home. It's been a great road." With his team-leading nine goals sparking a surprising Montreal club, Bernier truly emerged as an MLS star when he was named the league's Player of the Month for August. Being able to do it in his hometown hasn't just given Bernier a chance to catch up with some of his old hockey friends. It's even rekindled his love for the sport that first made him a star in La Belle Province. "I have a two-month break at the end of the season, so now I can keep in shape by maybe playing hockey. Hockey helps a lot in terms of lower-body strength. Your center of gravity needs to be low. It helps prevent injuries," Bernier said. "I'm hopefully going to be playing [hockey] once or twice a week to maintain a decent level [of fitness]. Maybe get some of those hockey sensations back from the good old days."